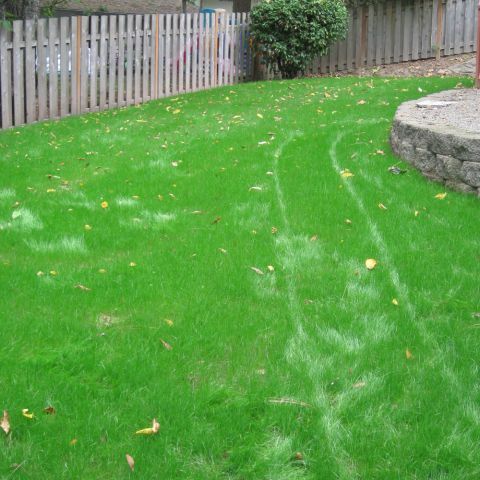 A seeded lawn is one where seeds are planted in prepared soil. These seeds grow into a lawn. Seed installation often saves money because seed is inexpensive. It is also lightweight and is easier to work with than sod. You can use a tape measure, a landscaping / contractors measuring reel, or even your walking stride to calculate the area of your lawn. Be sure to measure the length and the width of the lawn to be installed and multiply the two together. With this information you now have your lawn square footage (sq.ft. or just sf.). You will need 5lbs of seed per 1000 sq.ft. of lawn space. To determine your lawn seed type, ask and answer the following questions: Will your lawn be a high traffic area? Will you have friends and family playing sports or walking on it frequently? If so, a supreme seed mix is likely your best choice. Do you want to limit your mowing and maintenance time for the lawn? A blend of dwarf grasses is best for this use. These grasses will need to be mowed less often. What is the microclimate of the lawn? Use a sun mix if your lawn receives 4 or more hours a day of direct sun. Use a shade mix for moderate to heavily shaded areas. Is the lawn area very dry in the summer? Do you just want cover it? A low growing “cover” lawn may be your best bet. Your area has been measured, your seed selected and you own or have rented a tiller, roller and landscape rake and sod cutter. Now it's time to cut out the old lawn. First use a sod cutter to detach slices of the old lawn into sheets. After the sod is cut, roll it up in 3-5 ft sections and remove it. A helpful hit: It is best to have an advance plan to deal with the cut sod. Your old lawn is heavy and takes up a lot of space. A “drop box” can be delivered to your house and a big truck will haul the sod away. If you want to recycle your lawn another way, you can let people know on Craigslist that you have “free sod” and they may just come and pick it up from you. Or, to keep the sod really local, you can use the sod rolls to make a berm in a new location of your property. What every you do, have a plan for the old sod before you start the project. Now the sod is gone, be sure to remove all of the roots and clods of grass. Also remove any remaining weeds that were missed when you were cutting the sod. You want the soil surface clean before going to the next step. Your soil is very likely compacted and needs air and water drainage. Preparation is done with a rotary tiller and soil builders. The best choice for a tiller is a high powered, hydraulically driven tiller. This type of cultivator will do the work for you. A powerful tiller is a safe tiller and you will not regret having a hydraulic tiller for this job. There are several choices for building soil and because you will be tilling your entire lawn space about 4 to 6 inches deep amending is important. Turface at a rate of 50-100 pounds per 100sf of lawn. Use Turface if you want to improve drainage and add longer lasting loft to your compacted soil. It is also a good choice if you want a more convenient installation than topsoil. Spread the amendments over the soil and then till them into the yard. The tiller will incorporate these building blocks into your soil. It is important to note, now is the only time you can provide soil builder under the lawn. If you don't build the soil now, the lawn will loose much of the air and drainage you just worked so hard to provide. Top dressing of amendments is done annually to enhance a currently performing lawn not to fix a poorly constructed lawn. First rake the lawn with a heavy duty grader rake. New rocks and sometimes even yard “art” will pop up when you till. A grader rake tool finds these items, levels the bumps created by the tilling and removes the large “chunks” while smoothing your lawn. After the grader rake, use the landscape rake to remove finer pieces and shape your soil to the desired grade. These steps are critical to having a smooth and mow-able lawn for years to come. This is where the project gets really fun! 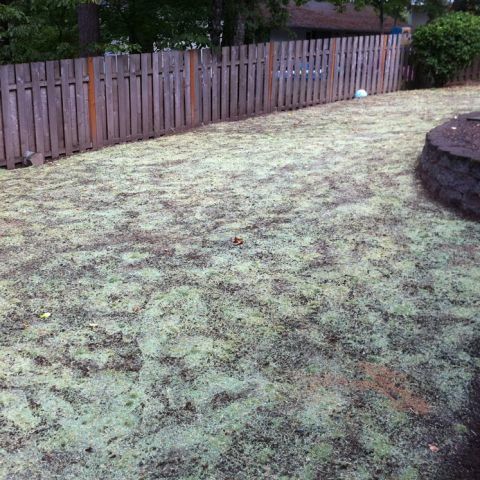 Using a seed spreader/broadcast spreader, spread the seed over your newly graded lawn. You can also use a powered overseeder to cut or inject the seed into the soil. Placing it at just the right depth for perfect germination and placement. It is fast, efficient and accurate and provided a very convenient way of putting down a lot of seed in a short period of time. With the seed installed, you now must keep it moist. The new seed should be kept damp for at least 2 weeks especially if the weather hot. A deep watering of about 1” every 7 days is a good average method to follow. At this point is is really important to be gentle with the seed. You don't want to damage the lawn while it is being established. The lawn will be solidly rooted in about a 6 weeks. Be sure your mower blades are sharp so you don't tug the new seeds off of the soil. If you are at all concerned the seeds have not attached themselves; if the conditions are really wet or really dry; wait a bit longer to mow. It is better to have the lawn well established then stress the new grass with an early mowing.